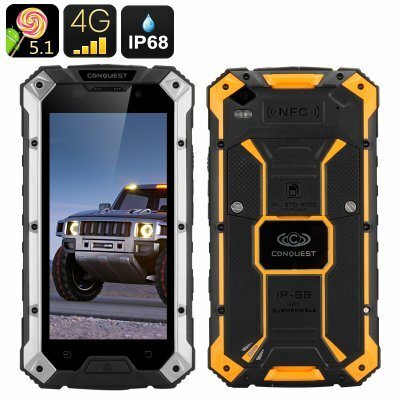 Successfully Added Conquest S6 Rugged Smartphone - 4G, 5 Inch HD Screen, Android 5.1, IP68, 3GB RAM, NFC (Silver Yellow) to your Shopping Cart. The Conquest S6 rugged smartphone comes with 4G connectivity on two SIM cards, a 5 inch HD screen, Android 5.1, IP68 waterproof rating and more. Thanks to an abundance of features and strong built, it’s a great outdoor smartphone that is ready to have your back on any adventure. Love the great outdoors? Have to spend long hours working outside? Or simply looking for a smartphone with a solid build that can take some knocking about? Take closer look - the Conquest S6 may be just the smartphone you are looking for. The Conquest S6 is waterproof, shockproof and dustproof + its screen is made with Corning Gorilla Glass with a 9H hardness rating. The 5 inch HD display is, thus, well protected against damage and is safe to offer you lots of entertainment on the go: movies, videos, web browsing and more. The Conquest S6 comes with 4G connectivity and dual SIM support. So, you will not only have a stable connection wherever you are, but also an option to have two separate accounts on the same device. With Android 5.1 and an Octa Core processor, you will have a great interface at your disposition and all the muscle needed to back it up. Plus, you can always stock up on more goodies at the Play Store. The 5 inch HD screen will show all your media off in great quality and is still compact enough to be convenient and easy to use on the go. The 4000mAh battery offers 7 hours of non-stop talk time + 350 hours on standby. With NFC for quick file exchange and OTG for wireless software updates, the Conquest S6 is a really smart device with lots of rugged toughness. The Conquest S6 Rugged Smartphone comes with a 12 months warranty, brought to you by the leader in electronic devices as well as wholesale Rugged Android Phones..